Ready to use equine legal forms available online with instant download in fillable PDF format. Our forms are valid in all 50 states and range from $14.99 to $149.99 for lifetime use. Involved in an equine legal dispute or have a horse law question? A consultation is required to answer questions or tell you if you have a case. We serve CA, NY, OR and WA. We provide custom equine contracts, incorporation and LLC formation, and expert equine business services and representation in CA, NY, OR and WA. Resolve issues with a national equine organization (such as USEF, FEI, AQHA and other equine associations and registries), we can help in all 50 states. ELS announces the release of an updated equine legal form – a new Simple Horse Sale Agreement. Our updated Simple Equine Sale Agreement is designed for designed for cash horse sales not subject to conditions such as a vet check or trial period. Changes include shortening the body of the sale agreement and including optional attachments for details about the horse’s health and care, training and behavior, and a right of first refusal. ELS will provide the new version free of charge to existing Simple Sale forms customers. New customers can learn more about the new form and purchase it here for $29.99. 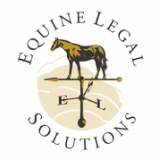 ​ELS Releases Two New Equine Legal Forms! ELS announces the release of two new equine legal forms – a Horse Trailer Use Agreement and Horse Trailer Rental Agreement. Designed for horse trailer owners who desire to lend or rent their trailers to someone else, these forms will protect the horse trailer owner in the event that something happens when another party is using the trailer. Both forms include clauses that require the user/renter to accept responsibility for any damage that occurs during their use/rental of the trailer, as well as the user/renter having adequate insurance and driver’s license/endorsements for towing the trailer. Also included are checklists to ensure inspection of the trailer before use, tasks required before the trailer is returned, and a list of contents. The rental agreement includes deposit and payment information. The new equine legal forms can be purchased for $39.99 each, or together in a package for the discounted price of $74.99.